LONG BEACH, Calif. - It was a new venue for the American Le Mans Series but a familiar result in the GT1 class as Oliver Gavin and Olivier Beretta drove their No. 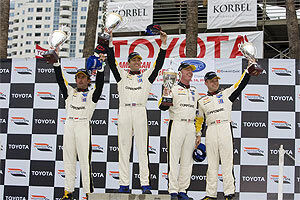 4 Compuware Corvette C6.R to their third straight win of the season. The two Ollies completed 71 laps on the 1.968-mile Grand Prix of Long Beach street circuit, finishing .349 seconds ahead of the No. 3 Compuware Corvette C6.R driven by Jan Magnussen and Johnny O'Connell. Beretta extended his record for the most ALMS victories with his 31st career win in the series, while Gavin notched his 22nd ALMS win. The pair now holds a 28-point lead over their Corvette Racing teammates in the GT1 championship. "It's very satisfying to get three in a row and have a decent points lead," said Gavin. "This race has been quite tough because the track changed considerably from qualifying to the race. It's a lot cooler today, and I think we had the car slightly too stiff for the cool temperatures. The track got very slippery, and it was difficult for Olivier because he had to push hard after the pit stop even though he'd had only six or seven laps in practice." The 100-minute race was the shortest in ALMS history. Both Corvettes made their scheduled pit stops at the halfway point, pitting one lap apart for tires, fuel, and a driver change. "I knew the only chance for us to get a win here was to push really hard on the out lap and beat the No. 4 car out of the pits," said O'Connell. "We did everything we could, and I even brushed the wall on the out lap. It would have been nice to get a win here, but congratulations to the guys on the No. 4. Nobody on that team is making any mistakes." Gavin agreed: "It pretty much came down to pit stops," said the Briton. "My tires didn't seem to come back in as well as Jan's did after the first caution period, and he was really pressuring me. Traffic gave me a bit of a break and enabled us to get some breathing space. Then the boys did a great pit stop and got us back out in front of the No. 3 car." The Grand Prix of Long Beach was the second of three consecutive street races for the ALMS series, and the Corvette drivers were mindful of the unforgiving concrete walls. "Today it was very important that neither car hit the wall because Le Mans is coming up soon," Beretta explained. "We all push hard in the these street races, but it's important that both cars leave here on four wheels. The track was slippery because the temperature was cooling down and I was in the middle of a lot of traffic. I am very happy for the result." Magnussen started in the No. 3 car, and his fastest race lap was quicker than his qualifying time by more than half a second. "The car was absolutely great," said Magnussen. "I could catch back up to Oliver when he got a gap. We needed to win this race, and we needed to nail it in qualifying - but we didn't, so we'll do it next time." Although Corvette Racing was unopposed in the top GT class, the team attacked the Long Beach course with all of its technical weapons. "The Corvette Racing engineering staff did a great job getting ready for our first ALMS race in Long Beach," commented Steve Wesoloski, GM Racing Road Racing Group manager. "It's a shame we don't have anyone to race because it would have been fun to prove it - to have someone to chase down or have them try to catch us. But this is the situation we have, so we're using these races to prove the cars' reliability and to keep the engineering staff and the pit crews sharp for Le Mans." Corvette Racing's next event is the Grand Prix of Houston, the third of three consecutive street races, on Saturday, April 21. The 2-hour, 45-minute race on the 1.7-mile JAGFlo Speedway at Reliant Park temporary street circuit will begin at 5:30 p.m. local time (6:30 p.m. EDT). It will be televised tape-delayed by CBS Sports on Sunday, April 29, from 1-3 p.m. EDT.